Review posted August 10, 2017. Simon Pulse, 2017. 380 pages. For the summer, Dimple wants nothing more than to go to Insomnia Con, where participants “come up with a concept for the most groundbreaking app they could conceive during their month and a half at the SFSU campus.” It costs a thousand dollars, so she’s a little suspicious when her parents readily agree. Meanwhile, Rishi Patel is looking at a picture of Dimple, a girl his parents have picked out for him to get to know. She is the daughter of their long-time friends who are from the same part of Mumbai as they are. And to get to know her, he can attend a summer program in San Francisco…. Rishi is very traditional and appreciates his parent’s loving concern for him. Naturally, he assumes Dimple’s parents have filled her in, too, and that she’s amenable to these plans. Dimple stared at him for the longest minute. The only word her brain was capable of producing, in various tonal permutations, was: What? What? Dimple didn’t know what to think. Serial killer? Loony bin escapee? Strangely congenial mugger? Nothing made sense. So she did the only thing she could think to do in the moment – she flung her iced coffee at him and ran the other way. Well, despite that inauspicious beginning, what follows is a sweet romance. 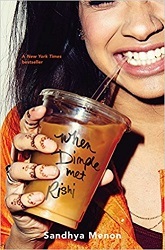 I would have liked Dimple to resist a little longer, but the way things unfold is quite plausible and a lot of fun. Now, I do have some skepticism regarding Insomnia Con. But I haven’t done any research – perhaps there does exist a web development program like that where a lot rides on a talent show (really?) in the middle of the program. Perhaps working in pairs never runs into trouble of two people both passionate about their app idea. Some of the subplots worked out a little too neatly as well. But make no mistake about it – I thoroughly enjoyed this book – enough that it kept me reading all through the night. This is a sweet story about a girl with a passion and what happens when she finds herself falling in love, against all her plans. Combined with a story about a boy whose well-laid plans get shaken up when confronted with an actual person. Very fun.